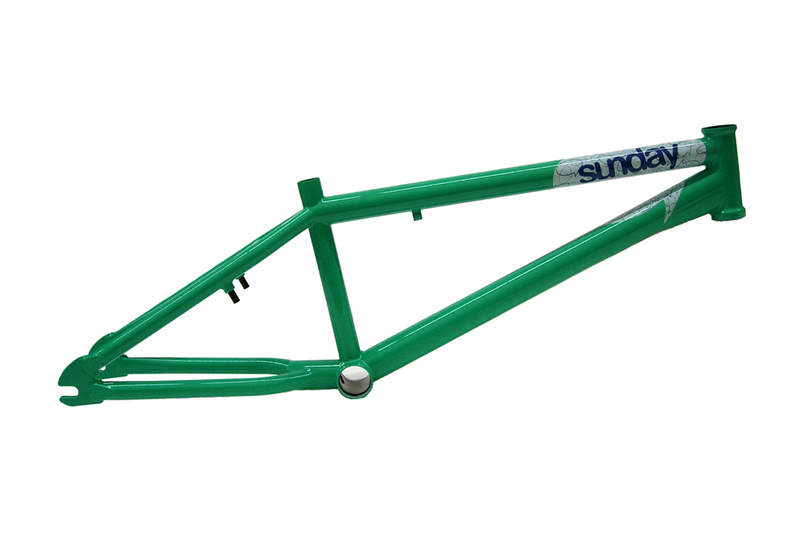 Sunday Bikes made their first waves in the BMX world way back in 2005, debuting the first frame built with Odyssey's infamous 41Thermal heat-treating process. Under the helm of rail innovator Jim Cielencki, Sunday's future included many technical advances not see elsewhere in BMX, such as the first built-in Pivotal seat post, hollow dropouts and dent-resistant crimped tubing, all backed up by a lifetime guarantee. You would think all of these special features would drive the cost of a new frame well into the $400+ territory, but the Sunday Broadcaster, signature ride of Massachusetts’ peg wizard Jake Seeley, retails for just $299. We’re hot on the heels of Sunday’s 11th birthday, and Jake Seeley has been on the team since damn near the beginning. I’ve had the pleasure of watching Jake ride since his pre-teen years, and it’s crazy to see how much he’s progressed over the past decade or so. We’ve talked about brand loyalty here on KYR before, so it’s really no surprise to see that Jake’s tenure with Sunday has earned him a full line of signature goods, but much like the progressive nature of Sunday’s products, Jake’s ultra-tech peg combos have upped level of innovation to the world of street riding that is nearly impossible to duplicate. The current incarnation of the Broadcaster frame is built for quick pops and even quicker spins, with a slammed 13″ rear end and a low 11.5″ bottom bracket, keeping your weight low & centered. The 75 degree head tube angle almost seems mellow compared to other street frames now available, but I think if Jake & the other Sunday team members riding the Broadcaster can make it work, you’ll do just fine hang fiving your local curb cut manual pad. As always, the Sunday Broadcaster features Odyssey’s patented 41thermal heat treating, and the 6mm hollow dropouts will withstand any ledges or rail you can throw at it. Jake hasn’t ridden brakes for years, but with removable brake mounts, you can, and at only 5.25 lbs., you won’t even notice the extra couple ounces AND you can confuse your friends with cherry picker drop-ins. The Sunday Broadcaster is available now at all Sunday retailers, which of course includes Dans Comp. Choose from 20.75″ or 21″ top tubes, with the current lineup of colors including Trans Black, Trans Teal, Black Cherry or Trans Slimer Green. You should know by now that the Broadcaster is only $299, so since you’re saving so much cash already, might as well reinvest in some new Seeley PC pegs, Street Sweeper tires, Seeley Grips or a Tiger Dye saddle. There’s even a Broadcaster complete for those looking to simplify the process and just get everything at once. Got any questions? The Sunday website should have all the info you need, and follow @sundaybikes on Instagram for team clips and fresh product news.